[Auto translated] There is a huge variety of plant you can feed your Guinea Pigs with. They are really vegans and like nearly everything which grows on ground. We provide an detailed list of food your Guinea Pigs might really like – and also a blacklist which food should not be provided to your cavies for some reason. This might help you to build up a proper diet for your cavies. Hay, vegetables, fruits, branches, herbs and other plant. There is very much you can feed your Guinea Pigs. Cavies listen to their natural instinct and really like to eat what grows on ground – raw. Most of all feed hay! This has to be provided permanent. You do your best to your cavies if you provide fresh picked grass too (please no lawn cuttings!). That is way cheaper than any colorful package of junk food from the pet shop and much more healthy as well. Leave the pet shop food untouched (have a look to the dry food / pellets article)! A special highlight for Guinea Pigs are these pants who are outside their accessible area. Small branched from trees and leaves are really liked. But do not aimless cut branches from trees in the wood. Vegetables should be the main fresh food in their nutrition plan at the winter season if/and there is no way to get fresh grass. Of course vegetables does not replace hay. Fresh hay has to be provided permanent. All green marked vegetables can be used for proper diet. Aubergine / eggplant Only the fit without the green. Asparagus Highly diuretic, feed rarely. Beetroot Feed carefully because of it oxialic acid. May take color on urine and feces. Can be provided with the green. Broccoli High amount of vitamin C. Contains oxialic acid. Provide it increasing. Carrot Rich in calories. Do not feed every da. Can be provided with the green. May take color on urine. Celery Can be provided complete. Peel if it is root celery. Chicory Not the outer leaves because of its high amount of oxialic acid. Cucumber Very popular food for cavies. Pumpkin Decorative gourds are no food! Radish Only feed the green! Rocket Feed rarely. Contains the ethereous mustard seed oil. Rutabaga Very good food for winter season. Rich in vitamins. Sweet potato / yam / kumera Rich in sugar and starch. Feed rarely. Can be provided with peel. Tomato Contains acid. Feed rarely. Plant of the onion family (contains leek and chive too) causes flatulence. Fruits should be handled as sweets for cavies and not to be provided too much (may be once a week) because of its fructose and fruit acids. Apple Do not feed if one of your cavies has lip grind. Banana Rich in sugar. Do not feed if one of your cavies has Diabetes. Can cause constipation. Kiwi Fruit acids irritate mouth. Feed rarely. Mandarin Fruit acids irritate mouth. Feed rarely. Orange Fruit acids irritate mouth. Feed rarely. Pear Rich in sugar. Do not feed if one of your cavies has Diabetes. Can cause diarrhea. Strawberry Can be provided with the green. Contains cyanide and is rich in sugar. Can cause diarrhea. Causes serious indigestion and colics. Fresh herbs can be provided without limitation. Dry herbs might be provided only a handful once a week cause the cavies run in trouble clearing their water balance otherwise. All herbs can be provided fresh or dried. Aaron’s beard / rose of Sharon Helps against anorexia and wound healing. Chamomile / camomile Helps against digestive complaints, anti-inflammatory. Mint / spearmint Not for breastfeed cavies. Peppermint anticonvulsant, Not for breastfeed cavies. Fir Provide rarely. Not really liked by all Guinea Pigs. Pine Provide rarely. Not really liked by all Guinea Pigs. Spruce Provide rarely. Not really liked by all Guinea Pigs. Fresh hay has to be provided all time. Water has to be filled up from time to time. Only use clear and fresh water. There is no reason to provide special “rodent-water” from the pet shop if you take care about the food for your Guinea Pigs. Fresh food are always undried vegetables or fresh picked grass which is natural rich in water. You should provide at least 10% fresh food of its Cavys own weight each day. Fruits should only be provided once a week due to its fruit acids and fructose. ← Animal shelter, breeder or pet shop? Can guinea pigs eat green foxtail? This is really helpful, was not sure how to remember what to feed them and what not to but now I know thank you ? Yes, they can and will like berries. But provide only a few as a snack rarely. Can I give my guinea pig dried beetroot? How often can I give my guinea pig beetroot? Of course you can, and your pigs will really like it. Take notice that the mouth and / or fur will be colored red like blood and also the urine will be colored. There is no problem with that. Don’t feed it more than once per week – also the dried one. How old can a guinea pig start eating vegetables? After 24 hours. 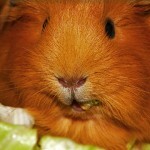 Guinea Pigs lose their deciduous teeth at womb and will be born with a complete set of teeth. I grow fodder of wheat. 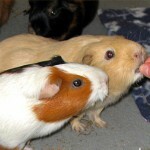 Can Guinea pigs eat fodder? can they eat other seeds and grains that are sprouted using a fodder system? Wheat is generally not suitable for Guinea Pigs. Wheat may cause flatulence. Be careful with all other seeds too and feed it not too much. It is just the same and fattening also. So my guinea pig is getting pretty fat, and that’s because i just refill his food whenever it gets empty so i think that he is just stuffing himself, should I take away his food and only feed him during certain times of day to make him skinnier? or what should i do? What do you feed? Guinea pigs should always have access to hay and water – may be herbs. Pellets and all similar industrial “Guinea Pig food” is often fattening because it contains much molasses (sugar), oat and other stuff. why can’t Guinea pigs eat mango. And is there a vegetable that I can feed my Guinea pigs daily? As already described: Mango may cause serious indigestion and colics. And like the humans recommend, a cavy also like a balanced and diversified diet to keep it healthy. My guinea pig doesn’t want to eat new things, she only likes carrots. Is there something wrong with her? New food has to be provided as a alternative first. Gradually it will accept the new food. Have you tried salad and cucumber so far? Most cavys like it very much. Can my guinea pigs eat peaches and nectarines? Stone fruits like peaches or nectarines contains (for cavy organism) much hydrogen cyanide and should not be provided. Can they eat gladiole leaves ? No. It is toxic and may cause some serious sickness. Thanks. Oh yes they could and would like bell peppers at their menu. It is rich in vitamins. But cut the stalk before and remove unripe spots. Can my piggy eat branches from my orange tree? It seems like it would be fine if an apple tree is. What is the best way for my piggies to get vitamin C? I have seen several places to not buy the ones to put in the water. How much do they need, and how do I measure it in fresh food? Thanks so much! Don’t worry about it. The best way is the normal way: A well balanced diet with all the variety of vegetables and (less) fruits contains all vitamins they need and keep them healthy. Additional vitamin c is only needed if one of your cavies is sick and/or can not eat regularly for some reason. How much vitamin c they need depends on many things (age, kind of keeping, health status, pregnant or not, male or female). The average is about 10-15mg / day, pregnant or sick pigs up to 25mg. Can my guinea pig eat the stalks and leaves of the cauliflower. Red or orange bell peppers are very high in vitamin C. Green ones are fairly high. I try to make sure my Guinea Pigs get some several times a week. My Guinea pig is abou 3 1/2 months old, when do I start giving her 1 cup of veggies a day? She seems so small to be giving her hay, pellets and veggies a day. You can start a full diet plan just from birth. My two are only 11 weeks and they definitely need pellets, veggies and especially hay daily!! Hope this helps. Can my guinea pig eat daisy’s? Can cavies eat brunches from a tulip poplar tree? As long as it’s kept to a minimum. You must not provide it. It contains glaucine which is toxic. Thank you for this site, it has been so helpful. Sorry one more question. When feeding cavies grass, what should I do with the grass before giving it to them? Such as washing it off first, or should I go as far as boiling it just to make sure that it’s safe for them to eat. I don’t treat my lawn with anything and all the animals are keeps in a separate part of the yard. Or is it OK to just give it to them freshly picked? Thanks again for all the helpful tips! You can provide fresh picked grass directly. It does not need to be washed or anything. But take care that you took grass always fresh (it begins to ferment shortly) which is not contaminated by urine from dogs (this is sensible for your hands too 🙂 ) or anything similar. And of course it must not contain harmful plant and should be dry (Not picking after a shower). While cutting flowers for a vase, my Guinea Pig began begging. I took a stem to her and she gobbled it down. She loves the stems, leaves and flowers. Now I have read that Alstroemeria is toxic. How toxic? What symptoms should I watch for if she is ill from it? Alstroemeria may cause serious problems and is highly toxic. At best case your pig was only druggy. If it began to tremble or shows some kind of spastic or numbness you have to immediately contact a vet. And of course make sure it never eat it again! My “Piglet” absolutely loves cilantro! What are your thoughts? You can feed cilantro as much as you want. Dried cilantro should only be provided moderate. Can I feed my guinea pigs sweet potato leaves and banana leaves? What can cure a respiratory infection? when the guinea will start breeding? should I give my pig a bath? Can my guinea pig have orange peels? Hi I am wondering why Holly is not considered ok for g.pigs I find mine love it and it’s considered a great tonic for rabbits? Holly may cause some serious problems with digestion and not at least with its nervous system. my guinea pig likes cucumbers so much,but nothing else.i heard that they need a bell pepper ‘couse it has the C vitamin in it but my guinea pig doesn’t eat it.also today i gave her a little piece of beetroot,is this a problem? Beetroot in small amount is no problem. And just offer some other food to get its diet more versatile. Starting with the green of carrot may be a good start (most of them really like it like cucumber). Can guinea pigs have any kind of nut? If so what kind or kinds? Nuts are not a suitable food for your pigs in all kinds. My guinea pigs have “free range” of my garden. So alongside daily servings of veg they can also munch on the grass as often as they like. However, they also go for a roam in my borders (despite being raised sleeper beds) and have a munch on the plants. I’m curious really that they will eat some things but not others. Mine will eat a few leaves of ivy and nibble on the fronds of my tree fern. They have in the past eaten maple and weeping birch leaves. I’m not feeding these to my pigs, they’re choosing to eat it. Do the pigs instinctively know what they can and can’t eat? It is a popular myth that our domesticated Guinea Pigs has still an instinct of what they can eat or not because they are not in the wild for generations and see only food we gave them. It is quite possible that they lost their instinct too much or completly. And this is what we see again and again: They eat what is provided. And they eat poisonous houseplant if they can too. The fact that they eat one plant rather than another is a result of its preference. Can we give our guinea pigs forsythia leaves? Oh no please do not! Forsythia is poisonous for guinea pigs and may cause serious problems! Can my guinea pig eat oat grass, I grow in small pots because my cats like it, And would like to give to the piggies when it starts to drop? Oat isn’t satiable and will swell at stomach. It could be harmful in higher dosage so feed careful! When you say Guinea pigs can eat branches, is it of a tree…? It seems so strange to me. Can they eat the bark? No. No rice, no boiled food, no milk. Generally. I was giving this to my hamster can cavy have soya chunks? ??????? does anyone know if you can give them Camu berries? I buy something called Sun Salad. My GP loves it. He especially loves the dried bay leaves. Can I just buy dried bay leaves at the market or are those different? He loves them. Never heard of it. Do you have a pic of it? My piggies will mainly eat cucumber, carrot, and lettuce + also occasionally Guinea pig food and they always have Timothy Hay. I want to expand their diet because I want them to be as healthy as possible. What would be a good extension of my girl’s diet? Well – everything shown in the green list above without hints could be a good start! Tastes differ so try and find out. Simple: Go to a vet! Can my Guinea pig eat mint leaves? If it does not lactate at the moment: Yes! How much oregano is alright to feed my pigs and is there any health benefits with it? Thank you so much! Provide it as a snack rarely. I’ve never heart about any scientifically proven health benefit. This website has been extremely helpful..I was just wondering if guinea pigs could eat mushrooms? Well, if you want to be save don’t serve it! Hi, can guinea pigs eat natural wheat kernels? They can but it is very fattening. Can they naw on Lilac wood? Please not. Lilac is toxic. Why can’t Guinea pigs have corn? We should differ “corn”. “Zea mays” as biolocial name / indian corn can be provided. Grain / cereal should not be provieded regularly because it’s fattening. I gave them a little the other day will it hurt? This is gold! 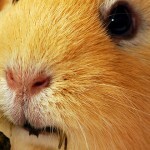 The best website I’ve found for my guinea pigs diet! Hi! So I was wondering if it would be okay to feed my Guinea pig grass in our lawn, but I’m worried because the grass is treated with fertilizer. Would it be okay to give my Guinea pig the grass or not? Oh please no! I’ve got no idea what fertilizer you use but if you want to feel save please don’t let them eat it! Can gps eat bean sprouts? They should not because cabbage like sprouts may cause indigestion. From what i have read so far cherry Branches and leaves cannot be fed to guinea pigs. I saw that in your list is in the safe place. Opinions differ. The “fact” that you should not provide any leaves of stone fruit like cherry oder peach because of its cyanide is only published by websites or books for animal owners. In our optinion it has become a meme / urban legend. If you read scientific statements or ask an botanist or toxicologist (over the time we do both) you’ll get the answer that cyanide can be only found in pip and seeds. So there is no problem to feed the leaves – and this is exactly our experience. It has never been a problem to feed cherry branches. What a wonderful site. I am about to assume ownership of 2 three year old sisters. I now know how best to keep them healthy! This is a very helpful list thank you! But I was wondering can Guinea pigs have branches from a lemon tree? There are not much information out there about the chemical substance of lemon trees so at this point I can not give you a clear answer, sorry! Dried herbs collectively without restriction. It’s helpful but it doesn’t mention how often to feed them it, has their are some negatives from certain foods e.g. Kale – good because contains vitamin c which they can’t make themselves but it contains a lot of calcium so it shouldn’t be fed daily. No kind of crackers or other cooked / baked food please. Can Guinea pigs eat corn on the cob ? Yes – and the leaves also. Do not provide it too much and they might love it! I’ve read on this page that they can eat hazelnut (branches, leaves) in large quantities. Is it ok to give them this on daily basis, at least when it grows in the forest? Yes you can. But do not forget to give them herbage and of course hay! we just gave my son a cavie for his bday and he is so happy with her and feeds her from his mouth.Is that dangerous? Also sticking to cucumber , yellow and green pepper as well as the hay that i buy from the pet shop. I,ve heard that cold veggies and wood shaving are not good.The shavings i buy from the pet shop and the veggies i cut and keep in the fridge. What is best? May be not dangerous but do you really think the cavy liked it to get food that way? You should put the veggies out of the fridge about 30 minutes before you give it to your cavy. You should not provide it because it contains oxalic acid. Hi can guinea pigs eat grapes or bread ? ?this was so helpful ?? You asked for when to start giving them fruits and vegetables? From birth! 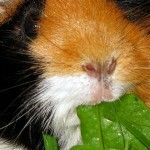 Can Guinea pigs eat the leave’s of the green pepper plant ? I’ve currently have no information about that, sorry! Can the guinea pig eat kale ??? Yes, but too much may cause digestion trouble. How do I bathe my guinea pig? Hi there! First I’d like to say this website has helped in my research and I am pretty educated on different parts of care, but I am not too confident in some info I’ve received for other owners and websites on what is the safest lotion/ moisturizer for skinny pigs, seeing that I am going to be an owner of one soon! Can a guinea pig eat pandan leaves ? I’ve got no information about that, sorry! My piggy seems to have a cold. She is sneezing a lot. What foods would be best to give her? I was wondering about giving her foods high in Vitamin C.
Food which is rich in vitamin C like any kind of vegetables is a good start. Can Guinea Pigs eat lettuce like the one you get from Coles in a pack? When I had GP I fed them twice with just store bought guinea food and always provided hay a nd water with a quater of Vit C tab in it. Then every weekend we’d lay out a ‘guinea pignic’ of peppers, tomatos, little bit of lettcue, cucumber, sometimes apple and sometimes strawberry. They would as a weekly treat sometimes get a carrot and I have fed my pigs half of a brussell sprout which only one likes. Grass and dandilion leaves they got in the Summer when they could graze outside. Do you think this diet is okay? Both my pigs lived until they were 7 which I’ve been told is an incrediable age. I want more in the future but this list scares me and I find it overwhelming. Should I just do what I know? Your diet plan is quite good as it is. Just take this list as an offer to vary or expand your diet plan. Seven years is a good age. May be not incrediable but really nice! Time for them to become old and wise. 😉 Do not change too much. My piggy LOVES broccoli, she will eat as much as I put down, is there a limit to the amount she should or shouldn’t have? Just have an eye on it! If your cavy gets indigestion it was too much and you should provide less. Collard in any kind may cause indigestion / flatulence. We are new guinea pig owner j have head lettuce also bananas I have to get her pellets(can the pellets for my stove work) I want to give her some treats can you please help me? Lettuce can be provied without problems. Fruits in any kind only as a snack because of its fructose. We just adopted two young adult cavies from a guinea pig rescue. Their foster parent recommended feeding them kale and they love it. I don’t see it on your list. Is there any problem with feeding them kale? Yes you can feed kale but be aware that any kind of collard may cause indigestion. The best you can do for a single cavy is another cavy. Humans can never replace a conspecific. Thank you for the info. What do u mean “provide it rising?” For broccoli? It’s been raining lots here but u said they can’t eat wet grass. Can I use a paper towel to get up moisture? All her veggies r washed and are wet when given so I’m confused. Uh – a terrible translation mistake, sorry. It means you should increase the amount and start carefully. Yes it is ok but try to vary the diet. I’m pretty sure they will like other veges too. Does any one else’s little piggie beg for food that’s being cooked? I’m constantly telling pig she can’t eat meat. Is this normal? Also can she have ivy leaves? Or are they poison? Ivy can be very toxic and should never be provided! You can provide just everything on the green list daily but you may vary a bit. Every day lettuce is as boring as every day pizza, right? Fantastic BIG HELP to my family in providing a Healthy life for our Pigs…..
thank you for the info, was very helpful, as my girls have 3 guinea pigs and it’s their first time having pets at home. Thank you for this great website–think of how many guinea pigs (and their humans) you’ve helped! My family has a long history with guinea pigs, yet there’s always more to learn. This list of safe and unsafe foods is particularly useful, and I’m going to put a copy up on my fridge so we can be sure we’re feeding our little guys the right things. Thank you Meagan! Well I’m a little bit ashamed because most of the content is still a result of auto translation and we know about the horrible grammar. It is a great challenge to build up a international site and keep the german version up to date as well. We’ve already got a detailed list in german and we will translate and provide it “some day”.